Garden Bloggers Encourage You to Garden | You Can Grow That! Sundrops are a bi-colored, fast-spreading ground cover that pushes up a wave of yellow blossoms in late spring and early summer. 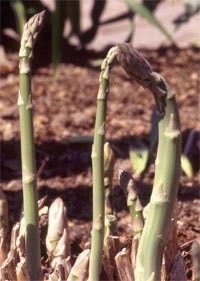 Asparagus: You Can Grow That! Do you have (or want) a fire pit? If so, you’ll want some Fire Pit Plantings. Color for the evening garden: You Can Grow That! Have you had success growing celery in your garden? Veggie Conversation Starters – You Can Grow That! Grow vegetables in a variety of colors and shapes, and people are bound to talk. When you design or redesign your garden into a water wise landscape, this is important. A plant that grows on plants? Why wouldn’t you grow that? Lemon balm is a beautiful green “landscape edible,” and is also as a pollinator plant.